This is a composite drawing of the original Design 1D drawings for the Evarts class destroyer escorts. The original drawings were produced in late 1943 or early 1944 and did not show a whaleboat. The vertical colors shown are Measure 31: dull black (BK) and haze gray (5-H). Deck blue (20-B) and ocean gray was used on the horizontal surfaces. 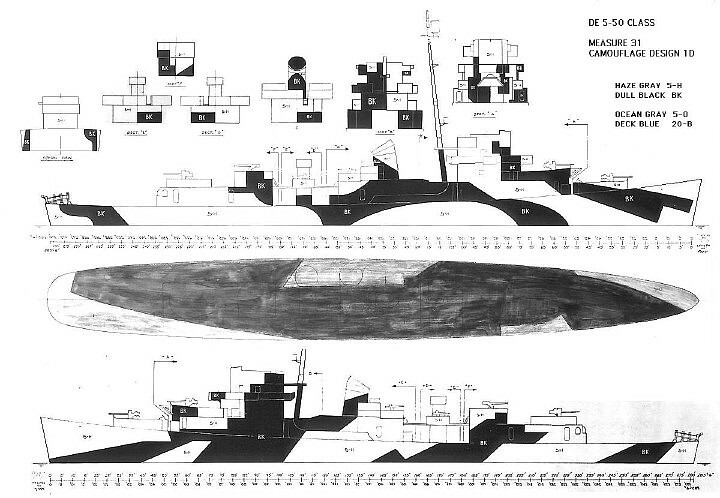 The first drawing for Design 1D was attached to the March 1943 Supplement to SHIPS-2 for DD-380 Gridley class using Measure 33. Design 1D was also worn by the battleship USS Tennessee (BB-43), the large cruiser USS Alaska (CB-1), the light cruisers USS Raleigh (CL-7), USS Houstan (CL-81), and USS Miami (CL-89) all in Measure 32 colors. The light cruiser USS Columbia (CL-56) wore this design using Measure 33 colors. In addition, Design 1D was worn by four Gridley class destroyers, one Sims class destroyer and at least five Fletcher class destroyers. Original drawing sources: NARA 80-G-172859 and 80-G-172871.